Today’s Friday Update at the Star Wars: The Old Republic site was not the update I expected. Actually, I’d been thinking it was high time for a new timeline installment, but instead, today we get a new biographies page to showcase some of the characters we’ve seen in promotional materials like the Threat of Peace webcomics or the Deceived trailer. By the way, if you have not seen that cinematic trailer yet, click that link, for the love of all that is good and holy click it NOW. 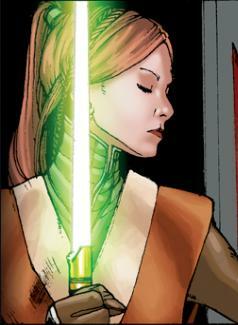 Satele Shan, direct descendant of KOTOR's Bastila Shan. Those who are dying from anticipation are already crawling out of the woodwork claiming that this isn’t a real update, but come on, it’s Developer Appreciation Week! And hey, I’d actually been reading those webcomics. In any event, it’s something new and that’s reason enough for me to be happy (and I’m sure that’s no surprise to anyone who reads this blog with any frequency). So they’re not actually giving us any real game information, but who cares? Not every update has to be gameplay-related. Are we forgetting the importance of the lore behind the games we play? Would the epic stories behind World of Warcraft have been as deep and engaging if we had no idea who the hell Mulfurion Stormrage, Thrall or Rhonin were? Wait, on second thought, forget Rhonin. I really, really dislike that man. Biographies is the foundation for something more… what exactly that is, I can’t tell you quite yet. All I can say at this time is stay tuned; E3 2010 isn’t that far away and we actually have some exciting (and new) updates for you before then. Fascinating, I can’t wait. I know, like, understatement of the year. So, um, any other bounty hunters thinking of going for the 100 million credits bounty on Grand Master Satele Shan? Anyone? Show of hands? Next up on the runway, we have T’Androma, sporting one of this season’s hottest designs in off-duty fashion. No way I'm disco danciiiiing! 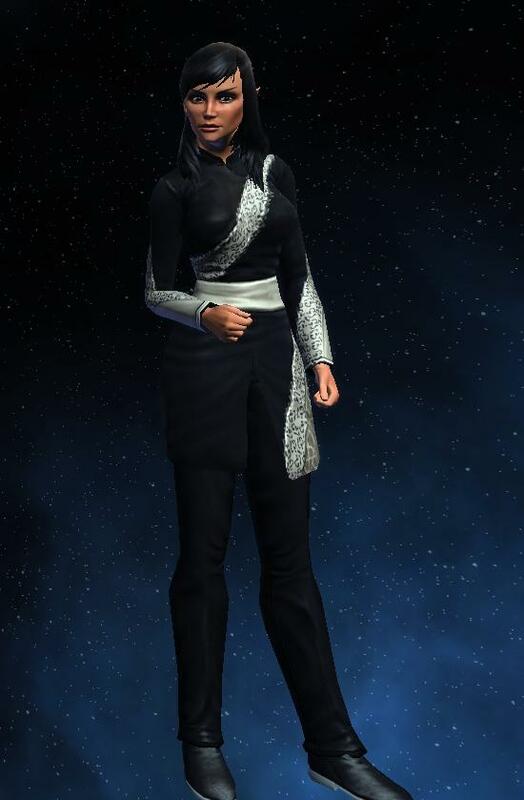 Off-Duty Uniforms – Now available at all participating spacedock tailors. You are currently browsing the MMO Gamer Chick blog archives for the day Friday, March 26th, 2010.